Redbird player Shakeela Fowler dribbles up the court at Redbird Arena during the 2015-2016 season. With the help of an Illinois State alum, the Missouri Valley Conference (MVC) Women’s Basketball Tournament will be held in the Quad Cities the next three years. 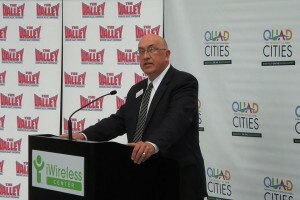 Joe Taylor announces Quad Cities’ partnership with MVC Women’s Basketball Tournament. Joe Taylor ’77, the president and CEO of the Quad Cities Convention and Visitors Bureau, secured the tournament for the iWireless Center in the Quad Cities from 2016 to 2018. This year’s Hoops in the Heartland tournament will be March 10–13, 2016. Taylor described this new partnership as engaging a community, not just renting an arena. Taylor has been with the bureau since it started in 1990. The bureau is a destination and marketing organization that promotes tourism to the Quad Cities. Taylor manages a staff of 12 and is responsible for getting people to visit the Quad Cities through tournaments, meetings, conventions, and leisure activities. The bureau is expecting 10,000 fans, spectators, players, and coaches to arrive in the Quad Cities the week of March 10–13. The 10 MVC women’s basketball teams, including Illinois State, will compete for the conference tournament title. Illinois State fans are encouraged to travel to the tournament. The official Redbird Rally at Brix in downtown Moline—date and time TBD once the bracket is set—will feature ISU President Larry Dietz, an assistant women’s basketball coach, former Moline-area high school and Illinois State standout Megan McCracken, Reggie Redbird, and performances by Illinois State’s band and cheerleading team. Tickets for the MVC tournament are now available at GoRedbirds.com/Tickets. Each MVC team has been assigned a liaison from the bureau staff. Taylor will proudly be working with his alma mater. Taylor transferred to Illinois State University in 1975 from Black Hawk College in Moline. He majored in history hoping to teach, but after graduation, he entered the newspaper business. He moved to the tourism industry in 1987. Taylor said his history degree taught him how to think critically by looking at the past. To prepare the community for the tournament, Taylor and his staff met with local businesses to inform them of the potential increase in customers. The bureau staff attended the 2015 tournament in St. Charles to promote their 2016 event. The tournament was previously hosted in St. Charles, Missouri, since 2008. 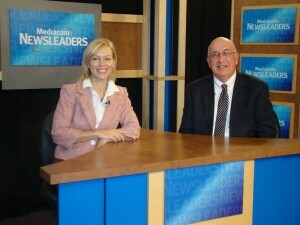 Bridget Anders can be reached at bkander@IllinoisState.edu.